The FOX News headline pictured above is why white, angry, non-Muslim men in the US men go on killing sprees against Muslims living in America. It’s why they burn mosques down to the ground. Throwing loaded terms like “global jihad,” “growing terror,” and “Muslim world” into the same headline is an impressive feat of propaganda. The headline reads as if the world is going to explode and that Muslims are to blame for this explosion. FOX News is yellow-journalism at its finest. This infamous media outlet is known for brainwashing people into thinking that Islam is the single greatest threat to humankind. One case in point is the story of Randolph Linn, who in 2012 tried to burn down the Islamic Center of Toledo. Linn reportedly told law enforcement officials that he was seeking revenge for attacks on US embassies across the Middle East and for Muslims getting a “free pass” in the US. That’s not all. While in court, Linn stated that he had gotten “riled up” watching FOX News and then drank 45 beers in seven hours before heading to the Islamic Center of Toledo to carry out his terrorist attack. 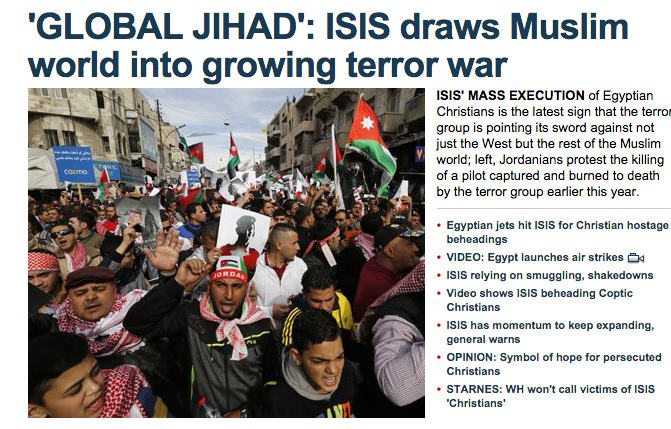 Can FOX enthusiasts like Linn deconstruct terms like “global jihad”? Do you think he understands that “jihad” has multiple meanings? Any Muslim analysts at FOX intellectually unpacking the term “jihad” or speaking on behalf of the so-called “Muslim world”? No, because FOX doesn’t want you to think or question anything. It wants you to simply watch. And believe.